Finn Earl learns a lot about life during his stay on the Osborne estate. Fierce People is a film filled with dichotomies and analogies. On the one hand it is full of satirical looks at society as it not so subtilely makes comparisons between the behaviors of the Osborne family, a rich upper class family living on a large estate in New Jersey and those of the Iskanani Indians, a primitive and savage tribe in South America. On the other hand it is a dark coming of age story about a teenager who is thrust into the Osborne’s strange world of wealth and power, and used as a pawn in the mind games that are being played by the members of the Osborne family. The film starts out in New York City, where we meet Finn Earl (Anton Yelchin) and his mother Liz (Diane Lane), who is a masseuse living on her own. Finn’s father is an eccentric anthropologist who has spent his entire career studying the Iskanni Indians and Finn has never even met him. In fact the only way that he knows anything about his father is through documentary films made about his work with the Indians. That major omission in Finn’s life is about to change, as Finn has been invited to spend the summer with his father in South America. But fate steps in in a weird way. Liz, who escapes from reality by using drugs, sends Finn down to the local “drug” store to pick up some cocaine. Just as Finn walks in to make the purchase, the place is raided by the police, and Finn is arrested. Upset by how she has messed up Finn’s life and summer plans, Liz contacts the only powerful person she knows, billionaire Ogden Osborne (Donald Sutherland), who owes her a favor. Through his connections, he is able to get Finn off on probation if the two of them come and stay on Osborne’s estate. Liz will provide Osborne with regular massages, and Finn will be out of harms’s way. Osborne even sends his own personal police chief (Blu Mankuma) to pick them up. Finn gets caught in a vicious, old style animal trap. Once they arrive at the Osborne estate and move into one of the vacant cottages, the Earl’s quickly get wrapped up in the quirky lifestyles of Mr. Osborne and his family. Mr. Osborne lives like a European aristocrat, in a large mansion with formal gardens and plenty of attention given to his every need. Liz provides him with a few hours of massage and an ear for his name-dropping stories. Mr. Osborne soon takes a liking to Finn, and decides to provide him with some paternalistic lessons about life that Finn was never able to receive from his real father. Through the eyes of Finn we meet the entourage of servants, greedy relatives, and strange hangers-on who populate the Osborne estate. Most significant in the story line are Osborne’s grandchildren Bryce (Chris Evans) and Maya (Kristen Stewart). While serious and shy Maya develops a crush on Finn, Bryce, who puts on a carefree, “let’s party all the time” demeanor, considers Finn to be a threat to his position in the family and works behind the scenes against him. Also thrown into the mix is a promiscuous maid (Paz de la Huerta), Osborne’s alchoholic daughter (Elizabeth Langley), a doctor (Christopher Shyer) with an interest in Liz and even greater interest in the Osborne fortune, armed animal hunters who leave dangerous traps in the woods, and a mentally impaired man (Branden Williams) who draws primitive chalk hieroglyphics on the grounds of the estate. Finn is both observer and protagonist as he becomes more and more involved with the Osbornes. Just as the primitive tribes have their rituals for settling conflicts, the story takes a dark and violent turn. Finn suddenly finds himself struggling to survive in the strange world of Fierce People. Maya and Dr. Lefler take Finn down the hospital corridor in a wheelchair. With so many strange characters and interesting subplots, Fierce People could have resonated a lot more as a story with audiences if it had stuck to its original whimsical look at the dark side of modern society. We certainly could have listened to more of raconteur Donald Sutherland’s stories of the rich and famous, and enjoyed more attempts of the Osborne extended family members to make each other miserable while spending their fabulous allowance money. The romantic relationship between Finn and Maya could have been pursued in a lot more detail, as could the relationship between Liz, Dr. Lefler, and Osborne, and it would have been interesting to find out additional information about some of the other eccentric characters. 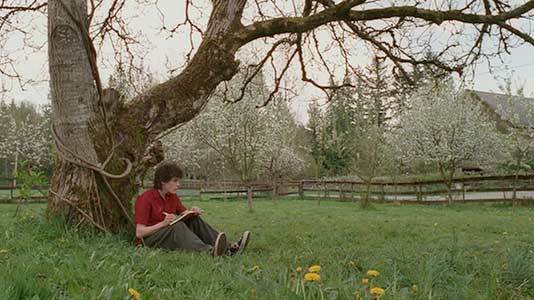 Instead director Griffin Dunne and screenwriter Dirk Wittenborn takes us away from the jocular and goes to the jugular, as young Finn is suddenly put in a dark struggle to regain his mental and physical well-being after being viciously attacked. Following an hour of fun and amusement, the last 45 minutes becomes more muted and grim. Perhaps the story could have made its points without being so melodramatic. The individual performance are well drawn, but somehow the sum of all of the parts seems less than a whole. Fierce People does make you think about things; its too bad that nothing seems really settled at the end. Finn’s mom Liz, Dr. Lefler, Mrs. Langley, Maya, and Bryce Osborne discuss things at the hospital. Finn tries to free his foot from the animal trap. Anton Yelchin, who likes to wear black high top chucks in his films, doesn’t disappoint us in Fierce People, but they only appear in one sequence of scenes in the film due to what happens in the story line. 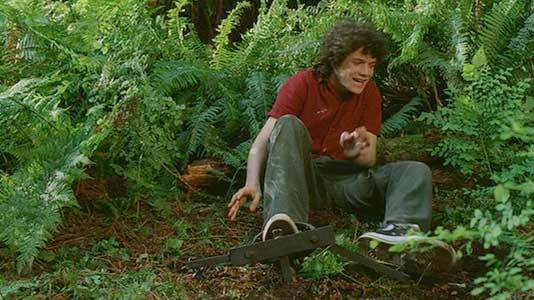 While running through the woods on the Osborne estate, Finn’s right foot is caught in an old style animal trap with vicious metal teeth on a hair trigger. The teeth of the trap impale his right foot, causing a severe injury and also ruining his black high top. The camera work shows a couple of grim closeups as Finn and then Maya struggle to release the trap. Later we see Finn in the hospital, with his foot bandaged, and being taken around in a wheel chair, while holding his damaged right high top chuck in his lap. This sequence of scenes is a good analogy for what happens to Finn in the story as his free spirit is caught up in the machinations of the Osborne family. One other character in the film, Whitney (Branden Williams) wears black high top chucks also. His role is basically a cameo as he plays a mentally impaired man who can’t speak very well and spends most of his free time drawing primitive chalk murals on the driveways and sidewalks of the estate. Maya helps pull the teeth of the trap off of Finn’s foot. Fierce People. (2007) Diane Lane, Anton Yelchin, Donald Sutherland, Chris Evans, Kristen Stewart, Paz de la Huerta, Blu Mankuma, Elizabeth Perkins, Christopher Shyer, Branden Williams. Directed by Griffin Dunne. Categories: Drama, Coming of Age, Sexually Explicit.